Nine-year-old Aiden Wriggelsworth is no Freddie Mercury. Neither is Michael Shotton. But the two, standing side-by-side at the Grand Rapids Symphony’s Picnic Pops, singing “Don’t Stop Me Now” by Queen, were entertaining just the same. 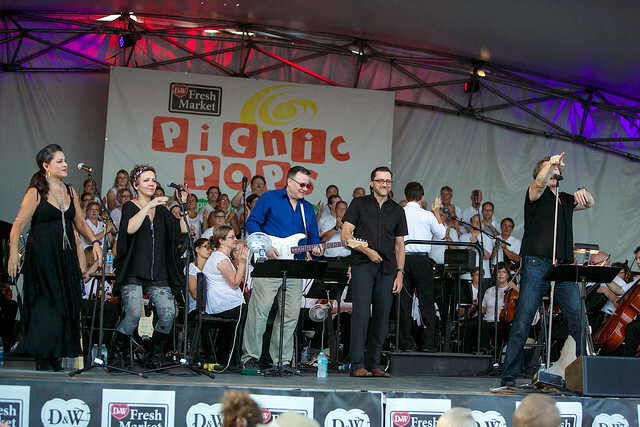 “The Music of Queen” brought Jeans ‘n Classics back to West Michigan and the Grand Rapids Pops for the second week of the D&W Fresh Market Picnic Pops on Thursday, July 21. Shotton, the lead vocalist, a tall, well-muscled guy with sandy blonde hair, looks nothing like Queen’s lead singer. Nor does he sound like the flamboyant singer and pianist who died in 1991, ending Queen’s stellar career as one of the best glam rock bands in rock music history. But Shotton knows how to sing, and he knows how to work a crowd. Some 3,100 fans plus associate conductor John Varineau and the Grand Rapids Symphony plus the Grand Rapids Symphony Chorus filled in the rest. Thursday’s opening night of two shows was great fun. Dubbed “We Will Rock You!” the concert in the D&W Fresh Market Picnic Pops repeats tonight at 7:30 p.m. Gates open at 5:45 for picnicking and pre-concert activities. Little needs to be said about the music of Queen. Mercury plus guitarist Brian May, bassist John Deacon and Roger Taylor tallied 18 No. 1 albums, 18 No. 1 singles and sold well over 150 million albums worldwide over the course of a 21-year career. With a catalog of music ranging from hard rock and heavy metal to progressive and glam rock, Queen can be all things to all rock fans. If you like rock music, you almost certainly like at least a few of their songs. When Shotton introduced “Who Wants to Live Forever,” mentioning it was among his favorites and asking for a show of hands from the audience who also liked it, Wriggelsworth’s hand shot up. Moments later, he was on stage singing along with Shotton while the rest of the audience joined in as well. Before the night was over, more kids were on stage and downstage, ringing bicycle bells to "Bicycle Race." By the end of the night, the hills of Cannonsburg Ski Area were covered with classic rock fans and classical music lovers dancing and singing along to “Fat Bottom Girls.” That's something Mozart may have fantasized about but surely could not have imagined. Jeans ‘n Classics, which has appeared twice in the past with the Grand Rapids Symphony, is a first-class operation. They know how to perform popular music convincingly without going overboard into mimicry. Guitarist Adam Martin contributed a wicked guitar solo on “I Want it All.” Songs such as “Killer Queen” were flamboyant enough without the need for spandex costumes. The group from Toronto, Ontario, knows how to work with a symphony orchestra, which is an art of its own. Shotton worked the crowd without out a let up, bantering with the audience between numbers, coaxing the crowd to clap and snap on “Under Pressure.” On “Another One Bites the Dust,” he scampered up the hill at Cannonsburg into the heart of the cheering crowd. He all but skipped down it again, holding hands with a woman in the audience while he sang his way back to the stage. When it came time for “Bohemian Rhapsody,” Shotton stepped aside and let the entire audience sing the entire first verse. Rarely is the Grand Rapids Symphony Chorus called upon to perform at Cannonsburg Ski Area. “The Music of Queen” simply would not have been possible without the chorus on the second half. Songs such as “We Will Rock You” were thick and full with the 40 or so voices on stage. “Bohemian Rhapsody” was a big hit thanks to everyone on stage. None were needed for Thursday’s show. Nor were studio overlays on songs such as “I Want to Break Free.” That’s what the Grand Rapids Symphony was for.